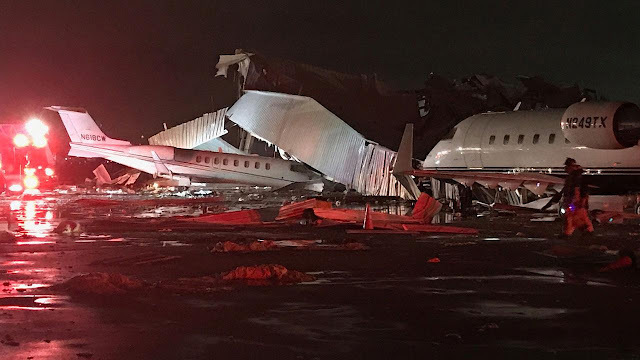 HOUSTON, Texas (KTRK) -- Houston police say no one is trapped inside a hangar that collapsed near Hobby Airport due to high winds during severe storms overnight. According to HPD Lieutenant Larry Crowson, police received a call a little after midnight to assist the fire department at the hangar for Jet Linx, a private jet company. This happened on West Monroe Road at Scranton Street. Crowson said straight line winds during the storm appeared to knock over the hangar onto at least three to four jets inside of it. There were initial reports that people were trapped inside of the destroyed hanger, but a security officer said no one is inside. New video from our Eyewitness News crew shows part of the hangar collapsed on top of a plane, and debris scattered nearby. We're told the hangar is unsafe right now, so crews can not go inside to check it out. ABC13 meteorologist Tim Heller says winds reached speeds of 60 miles per hour during the height of the storm. Houston Fire Department officials said they have no reports of injuries.